In case you haven’t already noticed…Adidas has made a serious comeback in the fashion world. 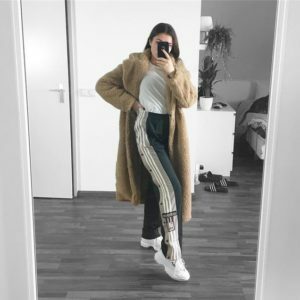 It’s nearly impossible to scroll through Pinterest, Instagram or even walk down the street without seeing somewhere wear the classic three stripe pants. Don’t get us wrong, Adidas has always been a go-to brand in the activewear world but this year they’ve made their way to street style. 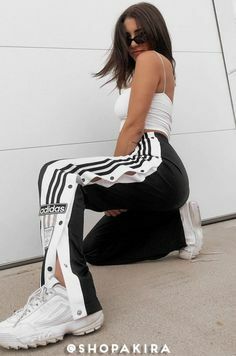 People everywhere have found new, trendy ways to wear Adidas pants. 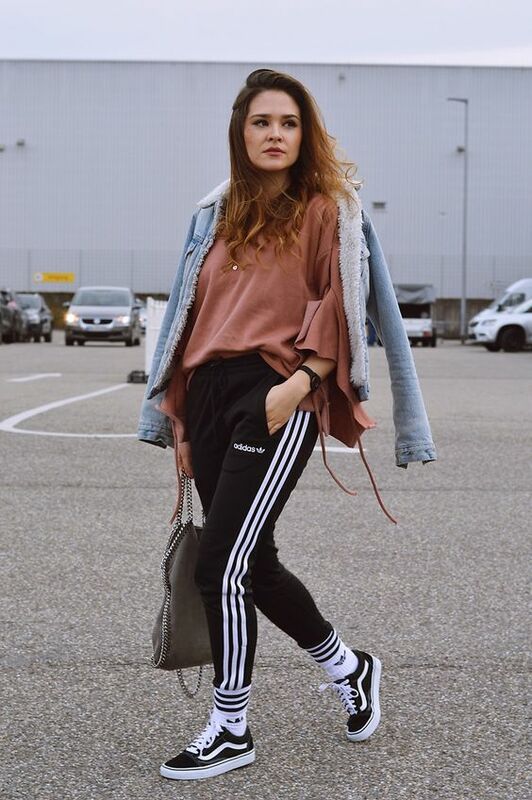 Whether you’ve already jumped on the trend or not we couldn’t resist showing you some style inspiration to wear Adidas pants this year. This outfit screams 90’s vibes and we’re here for it. 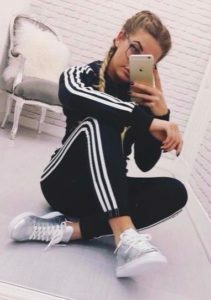 Keep your outfit simple, yet trendy, by styling Adidas pants with a white top, chunky sneakers and completing the look with some small sunnies. It really doesn’t get easier to look stylish. 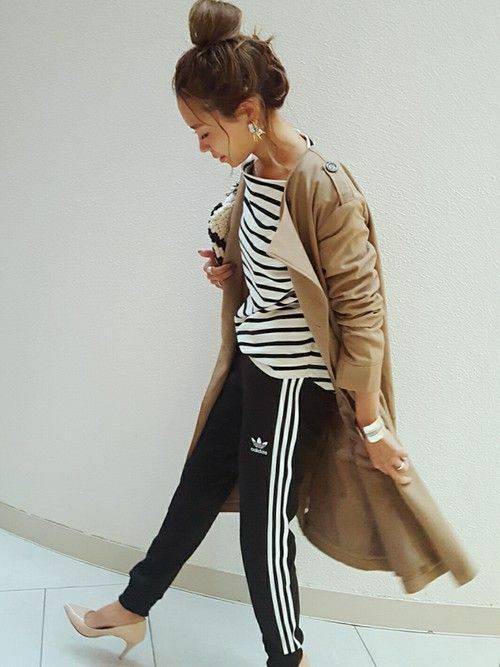 We’re obsessed with this take on styling Adidas pants. This outfit is a great example of how you really can dress up Adidas joggers. Keep it monochromatic to add a chic-level with a black top, black fur coat and black pumps. Adidas has long been known for the classic tracksuits and honestly, they’re classic for a reason. You really can’t go wrong with the standard black striped pants and matching jacket. It’s easy but has a way of always looking put together. Add a little dose of glam with metallic sneakers! 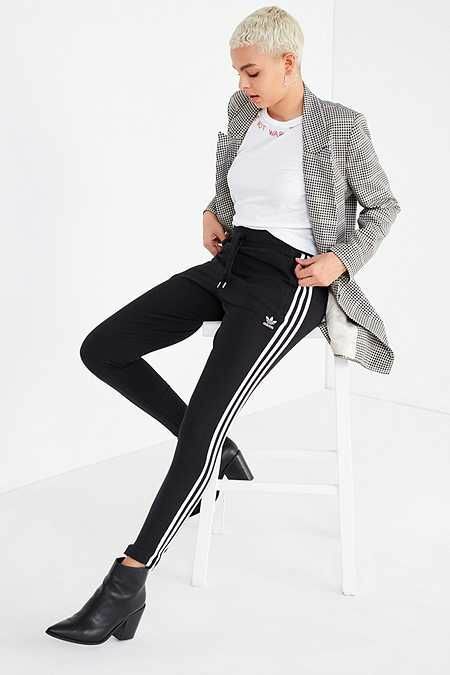 Yep, you can add a boss lady vibe to your Adidas pants. If you work in a creative office, this could potentially be a work outfit. Regardless, styling a plaid blazer and black ankle booties with Adidas pants is how you can make your outfit match your bossy lady persona. 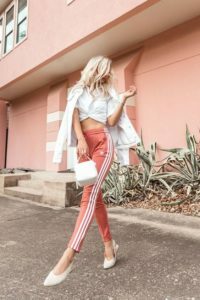 Spring is here and if you want to add some pastel hues to your looks, this Adidas outfit is for you. We all love the classic black Adidas pants but how great are these pastel blue pants? They feel so modern, especially when they’re paired with this light beige crop top to keep the light tones. Stand out but keep it cozy with a fun color in an Adidas tracksuit. The great thing about the classic tracksuits from Adidas is there’s no matching necessary. 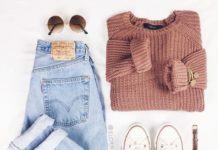 It’s the ideal outfit for running errands on a Saturday afternoon – or anytime you want to look cute without a lot of effort. 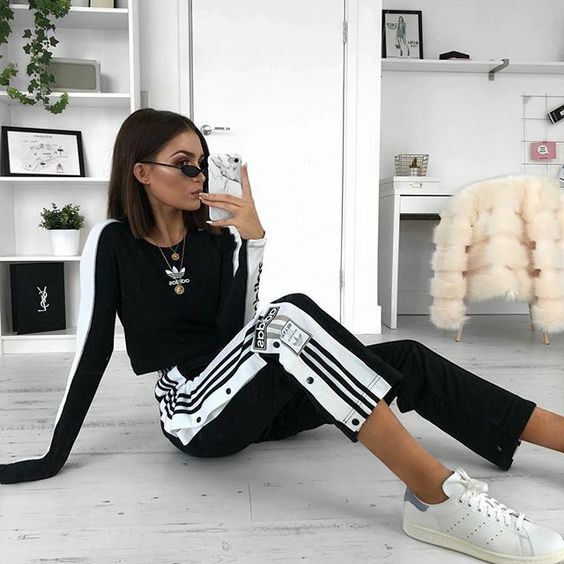 Style Adidas pants like an actual model with a body suit, strappy heels and big sunnies. Hey, if Bella Hadid can do it so can we! The key here is to keep the color palette simple. In this case she stuck with all black, it creates a flow to the outfit even with the juxtaposition of the pieces worn. 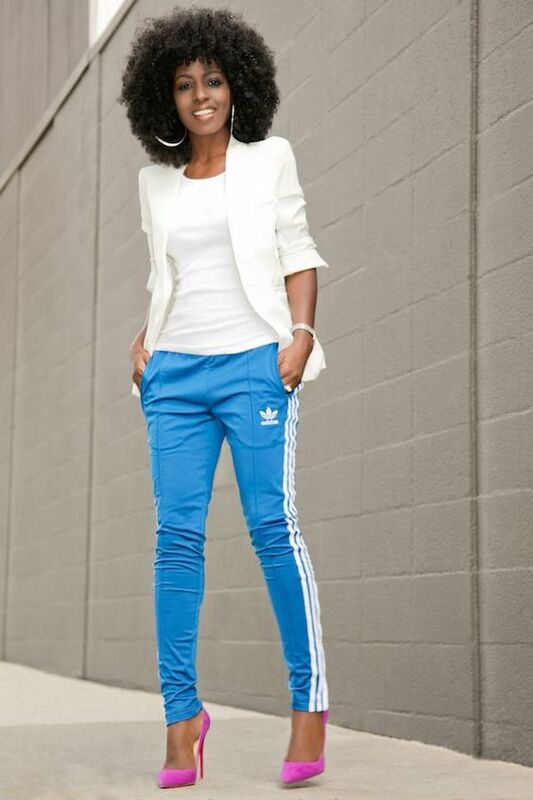 Monochromatic dressing is a big trend this season and Adidas pants make it easy to embrace the trend. Mix it up a bit and swap the black out for another color, we love this warm burgundy hue. The neutral, dressed up accessories take this outfit from the gym to dinner easily. Camo print is having a moment right now. It’s an edgy print that looks great paired with other neutrals, particularly black. This outfit is still pretty casual with Adidas pants and sneakers but the camo top adds some depth and personality to the look. This outfit is great if you want to go out and about right after the gym. 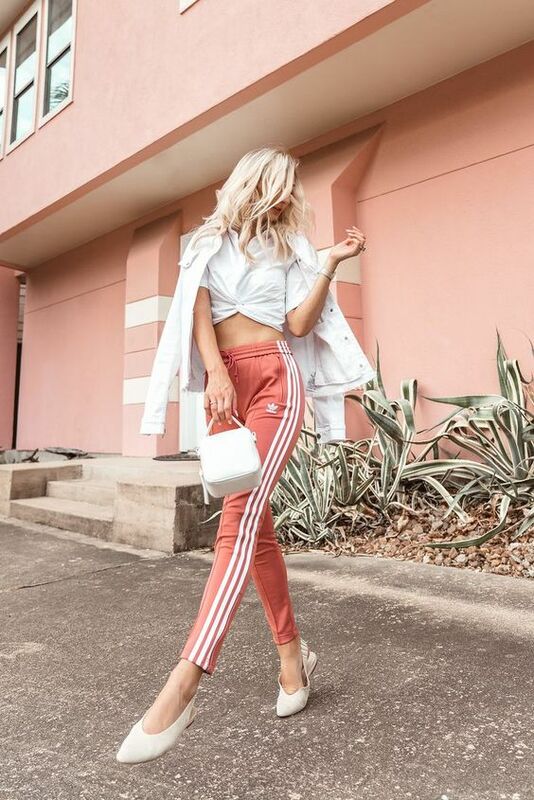 Rock your Adidas pants, crop top and sneakers to your workout and make it ‘normal life’ appropriate by throwing a statement jacket over your shoulders and using a fun bag. It’s likely you have all of the items in this outfit hanging in your closet already. 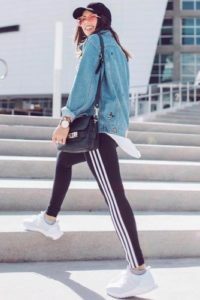 Head out to brunch or a casual lunch on the weekend in your Adidas pants when you style them with a denim jacket, baseball hat and white sneakers. Easy, stylish and comfortable! 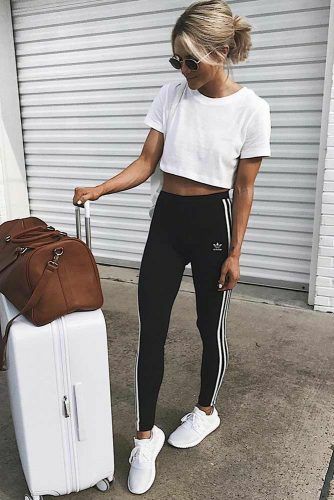 You can’t go wrong wearing a white crop top t-shirt with Adidas pants. It’s the epitome of athleisure dressing. Add an edgy twist to the go-to outfit with a touch of fishnets. Layering UNDER your pants, with the fishnets peeking just a bit out of the top of your pants gives the look a whole different feel. Ok, how insanely chic is this outfit? It’s everything! The combination of textures with fur and sheer with Adidas pants is something we never would have thought would work but it does. This outfit is a great example of combining opposing style personalities to create a unique outfit. As the temperatures rise you’re not going to want to wear sneakers everytime you wear your Adidas pants casually. Slides are the perfect alternative when it’s warm outside. Of course, we love the fur slides for a girly twist. We have to give credit where it’s due, Kim K was one of the first to bring Adidas pants back onto the fashion scene and wear them dressed up. Lacey bodysuit, statement choker and heels get a street style makeover when worn together. You can’t go wrong with a leather jacket…ever. This outfit shows us, once again, leather jackets are a wardrobe staple and can be worn with anything. Completing the look with strappy heels elevates the casual, edgy outfit. Neon is EVERYWHERE right now and won’t be going anywhere this year. Add a bold pop of neon to your Adidas pants with matching shirt (or bodysuit) and strappy heels. The colors complement one another beautifully and give the sweatpants a little bit of an edge. Graphic t-shirts are a great go-to to wear with Adidas pants. 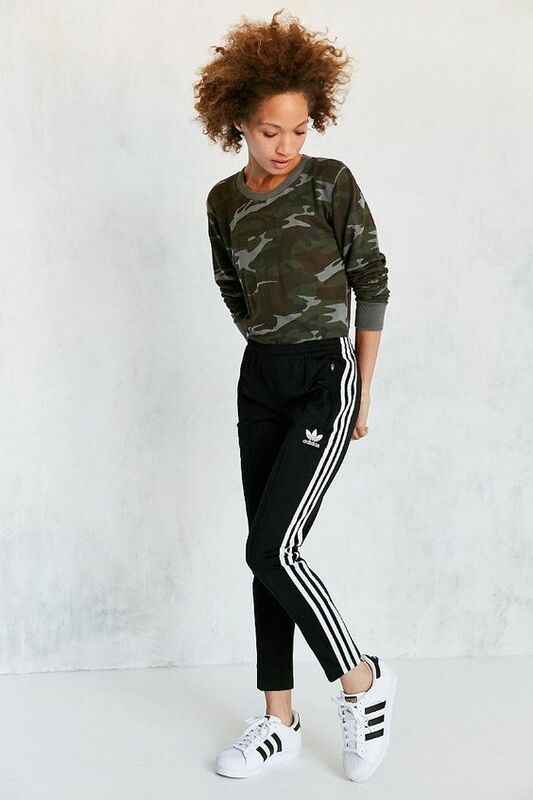 It complements the casual aesthetic of Adidas pants. We love the bright color tee here next to the classic black Adidas striped pants for a pop of color. Dressing chic doesn’t always mean high heels or a lot of fuss. This woman shows us how it’s done. 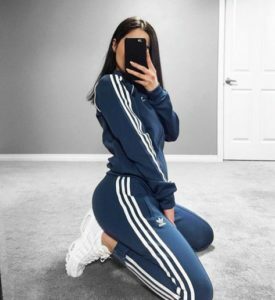 Slide sandals and a well-fitting turtleneck sweater are incredibly comfortable and when they’re worn with bright blue Adidas pants it’s effortlessly chic. 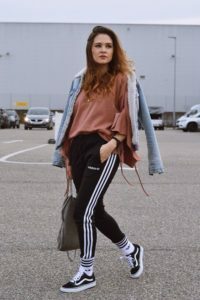 Wear Adidas pants all spring long with this outfit. We adore the light colors worn together here to keep it light and bright for those spring days. Ideal for a shopping day with your friends or a casual lunch/dinner. Adidas pants will always be a go to for athletic wear. 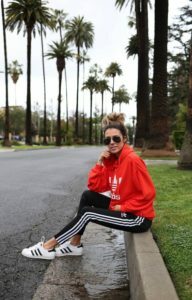 I’m sure after going through the list with some of our favorite Adidas pants outfits you’re looking at these coveted sweatpants in a whole new way. One of the great things about fashion and trends this year is their out of the box vibe. 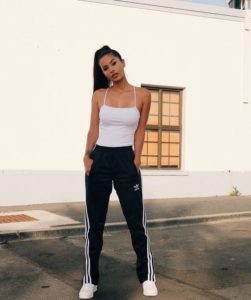 Normally, we wouldn’t necessarily think to wear high heels with Adidas sweatpants but women everywhere are making it work and looking pretty amazing doing it. 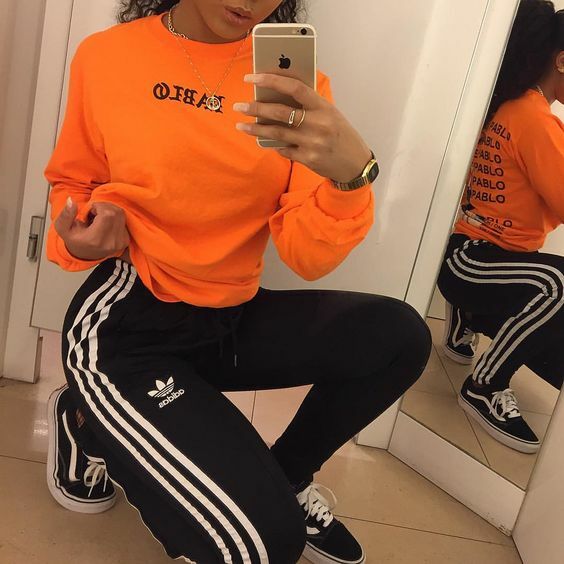 Through these outfit ideas we’ve seen just how versatile Adidas pants truly can be. As it turns out, they can be so much more than comfortable sweats we wear around the house or to the gym. 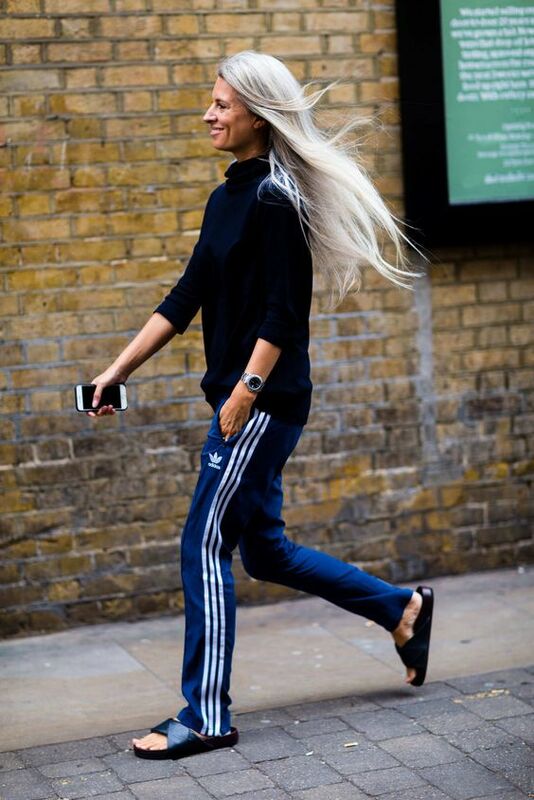 Wear Adidas pants to brunch with the girls and style them with a nice blouse, shoes and handbag. Keep them casual and maintain that athletic vibe with a simple white tank and Adidas sneakers. We could go on and on to share different outfit options but you get the point. Not to mention you can scroll through our list to get some inspiration. 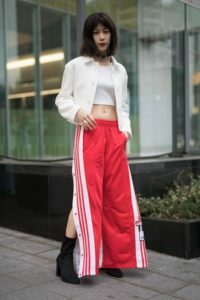 If you’ve been strictly wearing Adidas pants, or something similar, in your downtime it may seem a little odd to start styling them in different ways because it’s, well…different. The important thing to keep in mind with style in general is it’s not permanent. Wearing clothes in different ways can take some getting used to but it’s not permanent! Decide you don’t like the way your outfit looks? You can take it off and swap it for something different in mere minutes. Our style is such a great way to express ourselves and a great way to feel even more confident in our skin. We can’t wait to see you rock your Adidas pants in a whole new way this season.